I just dropped off Andrew at 4:15 a.m. for the bus that is going to take him to the starting line of the Los Angeles Marathon where at 15 years old he will run a race that will hopefully become a living metaphor of all the possibilities that life has to hold for him. He and a friend decided they were going to do this back in August and started training with their high school branch of Students Run Los Angeles (SRLA), and they have definitely put in many miles. In combination with cross country and track, he has easily run nearly 500 miles since the day he came home last summer and collapsed after his first three-mile run. It is exactly seven years ago this weekend that I became Andrew’s dad, and I couldn’t imagine a better way to celebrate this journey we have taken together. As I watch my son turn into a man before my very eyes like a lapse-time video of a budding flower, I can hardly remember the spastic, uncontrollable man cub that terrorized cats and dogs and put fear into the hearts of many a teacher and family member. There was a well-deserved reason that early on my friends called him Mowgli, but he has long left the jungle and earned my deepest respect and admiration for his ability to accomplish the goals to which he sets his mind. That’s not to say that raising Andrew has suddenly become easy. I have come to accept that it is always going to have its challenges. Fatherhood is much like running a marathon with Andrew as my coach. He has put me through my paces and whipped me into the kind of man who can confidently push on when we hit one of the many “walls” that make up this beautiful race. I see this tenacity and perseverance in him in other areas of his life as well. I can’t help feel a bit guilty for pulling him into our vegan Lenten journey at the very time he’s been training for this race, but he has stuck to it even when he knows that he has the best excuse in the world to break from it. That’s not to say that he hasn’t thought about it. I asked him what he wanted for his celebration dinner and the first thing out of his mouth was “Spaghetti Carbonara,” our pre-vegan feast of bacon, eggs, and cheese. Since then, however, he has slowly been working out his desire for meat with his desire to stick to our meatless goal and has moved from carbonara, to steak, then chicken, and then suddenly last night he said he wasn’t sure if he wanted meat at all. Right now he has decided on sushi, but I have a feeling he may want to stay the course and I have all the makings for Pasta Puttanesca with olives, tomatoes and capers on hand just in case. There’s just nothing that can beat the feeling of setting a lofty goal and reaching it. That is a lesson that can only be learned on your own. As parents we can encourage our children to do their best, but it has to come from within them for it to count. I had to get up before the sun every weekend to drive him to his training run, but he was always up before me and was ready when I rolled out of bed and “slept drove” him to the school. I have to have everything on hand to make a vegan Lent possible, but it’s up to him what choices he makes with the nine hours each day he’s on his own. We live in a world where parents are more involved in their children’s lives than at anytime in the history of mankind. In this day and age of “helicopter” parenting, watching Andrew become a reliable and independent young man has taught me that when you hover above your child it only serves to keep them from spreading their own wings. Today’s marathon is as much a powerful metaphor for Andrew and his future as it is for me and my changing role as his father. So today I’m going to stand on the sidelines and cheer him on at intervals throughout the course of the marathon and watch him spread his wings and soar. The training wheels are off and in the blink of an eye he will be out of sight and his real life’s journey will have begun. P.S. Andrew finished the marathon today in 4 hours and 12 seconds. He cramped up at mile 24.5 and had to be iced. They told him to walk the rest of the way in, but he got up and started running and didn’t stop until he crossed the finish line. He also didn’t take off his medal until he went to bed… He may even be wearing it as he sleeps tonight! Andrew training for the marathon while on a vegan diet had me worried for a while, but the truth is that getting the right amount of protein has been easy with an increase in beans, lentils, and tofu in our diet. Vegetables have been even easier. We belong to a CSA (Community Supported Agriculture) that delivers a giant bag of local organic produce every Friday and it’s all we can do to get through it all before the next bag arrives. The hardest part is coming up with dishes that use the ingredients currently being harvested at the farm. This time of year means that we have been getting tons of kale, chard, spinach, and collard greens. Popeye would be happy, but I have to get inventive to satisfy the hungry carbo-loading runner here at the house. In fact, we have been doing so much carbo-loading the last few days that if I don’t see pasta for a while, it will be quite all right with me. 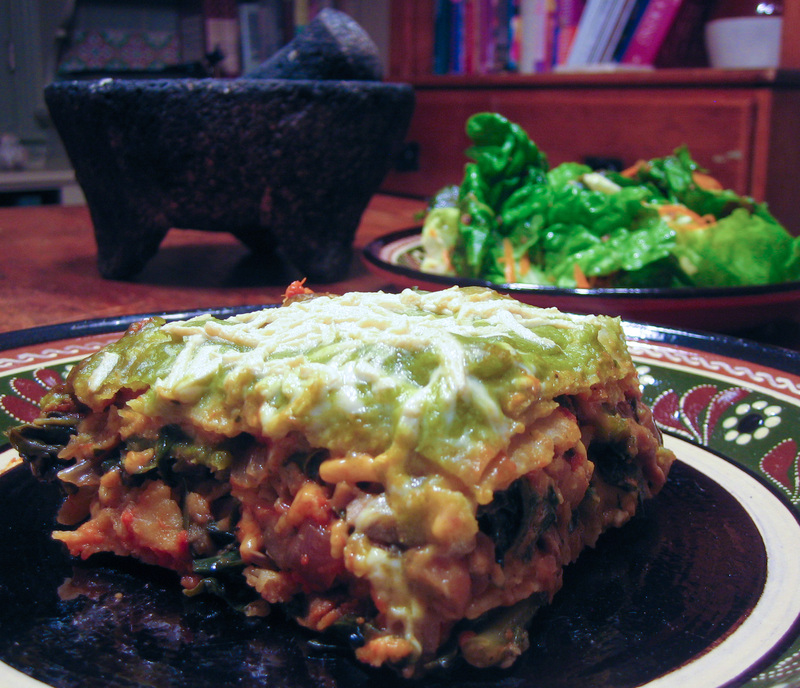 Here’s a dish based on a recipe from Rick Bayless’ s Mexican Kitchen cookbook that let me use up some of my veggie bag and get a nod of approval from the peanut gallery. There are a few different components to this dish, but the sauce can be made days ahead and kept in the fridge until ready to use which will make putting this together easier. 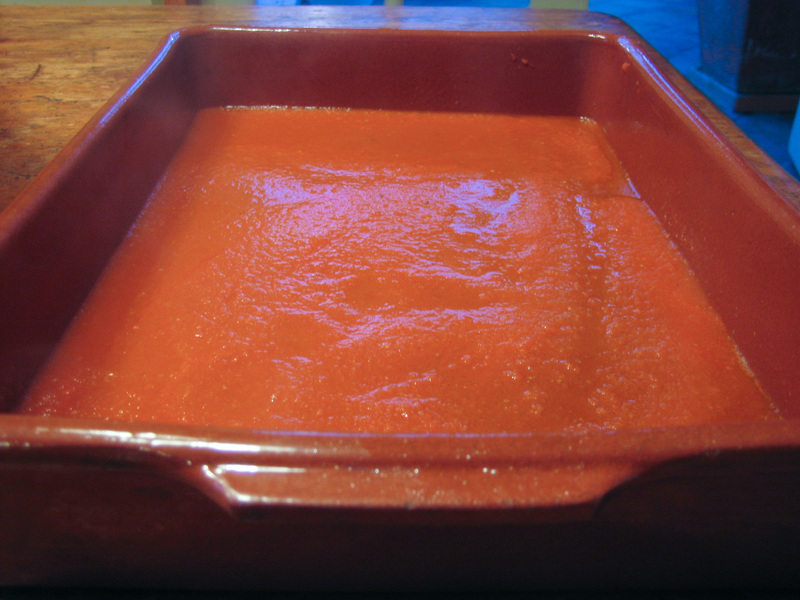 This sauce also makes a great cooking medium for shrimp and other seafood. 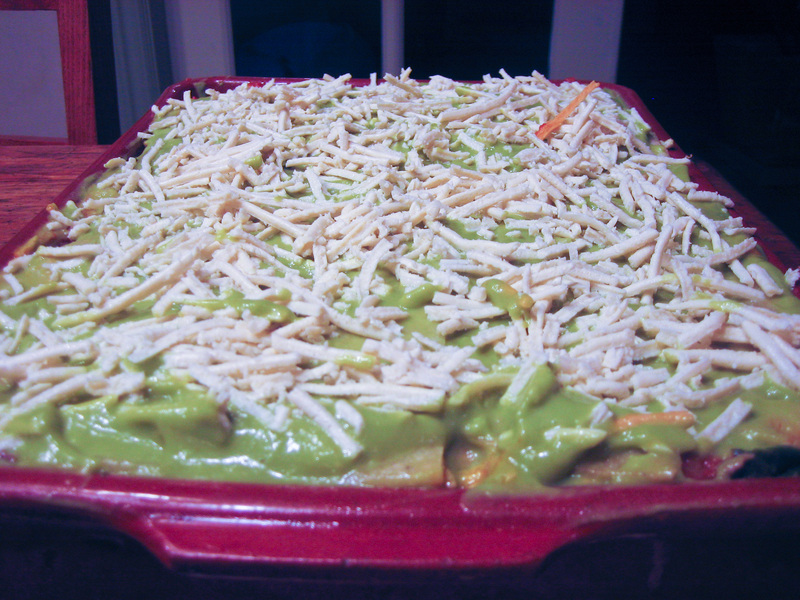 It’s very popular in Veracruz where I learned to make it and is one of my favorites. You can roast the tomatoes under a hot broiler for about 6 minutes until they start to blacken or boil them for 3 or 4 minutes until the skin splits and the tomatoes just start to cook. Either way, let them cool, remove the skin, and put in a blender. 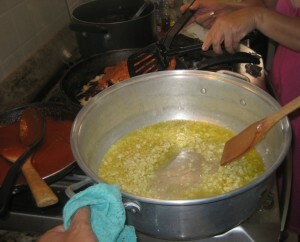 While the tomatoes cool, sauté the garlic in the oil until they give off their fragrance and start to just turn color. 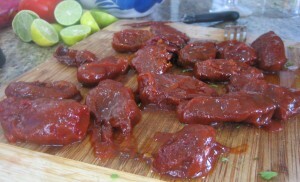 Remove them from the heat and pour garlic and oil in with the tomatoes, add the chipotle chiles and 1 teaspoon salt. Blend to make a sauce. 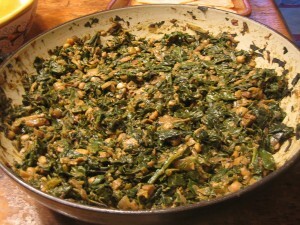 Pour the sauce into a skillet and cook on medium until it begins to thicken, about 10 minutes. Adjust with more salt to taste up to another teaspoon. 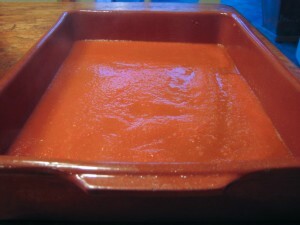 The sauce is ready to use or can be refrigerated for up to a couple of weeks until ready to use. Note on Chipotle Chiles: If you are sensitive to heat, start with half a can and work your way up. In Mexico, they would use many more than one can (see photo). You don’t need it, but I always have it on hand and finish the dish off with it because Andrew likes the flavor. If you don’t use it, just top off the lasagna with red sauce. It will be just as good. I used ¼ cup in my greens as well, but again, that was because it was on hand. To make saute 12 jalapenos in about 1/2 cup olive oil with 4 or five cloves garlic unti lightly browned. Pour everything into a blender and and add 2 tsp Knorr Suisa and salt to taste. Add water to get the water down the consistancy if it’s too thick. It’s hot and delicious. Wash the greens very carefully in a salad spinner and cut the stems away from the leaves. Finely dice the stems (like you would an onion) and roughly chop the leaves. Heat two tablespoons of olive oil in a large sauté pan and add the onion and stems from the greens. 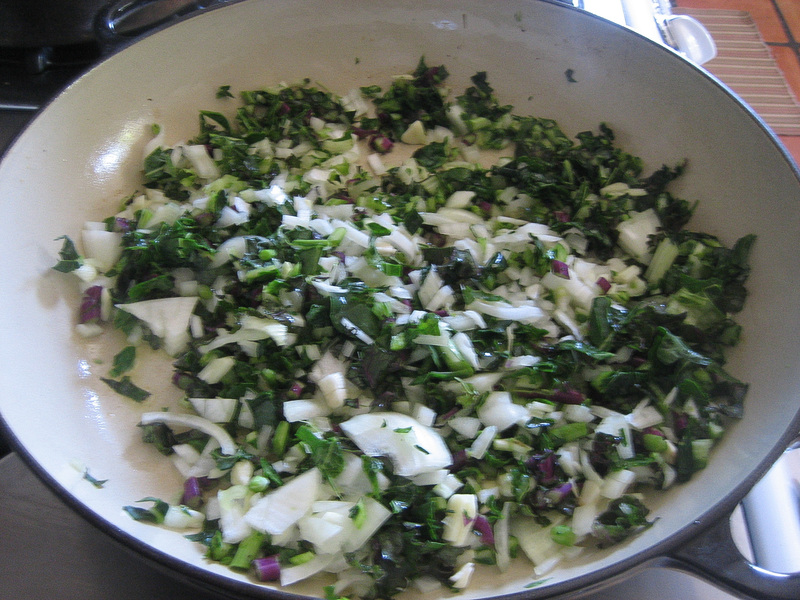 Cook over medium heat until the onions are clear and the stems soften, about 10 minutes. Add the garlic and beans and cook for a couple of minutes more. 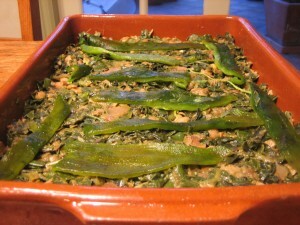 Add the green leaves and a little vegetable stock or water to moisten the greens. 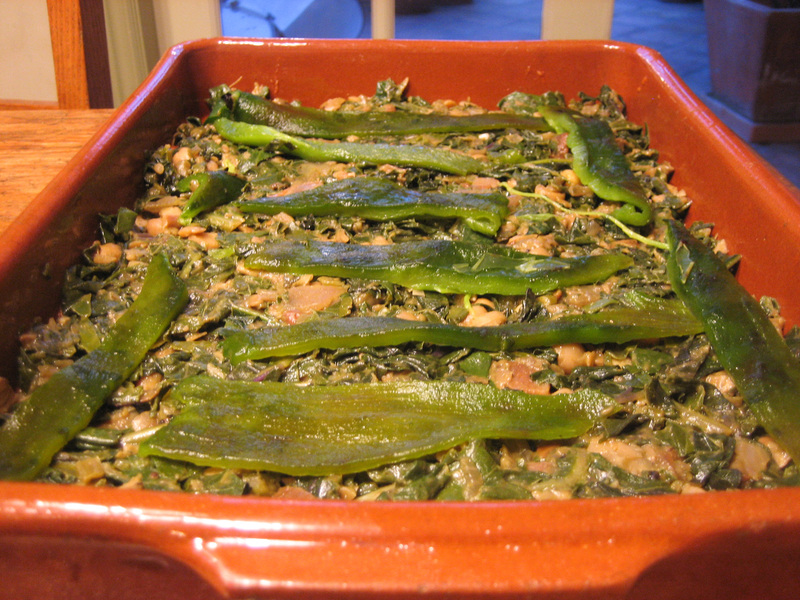 It will seem like a lot of greens at first, but they quickly cook down. Season with salt and pepper and set aside to cool. 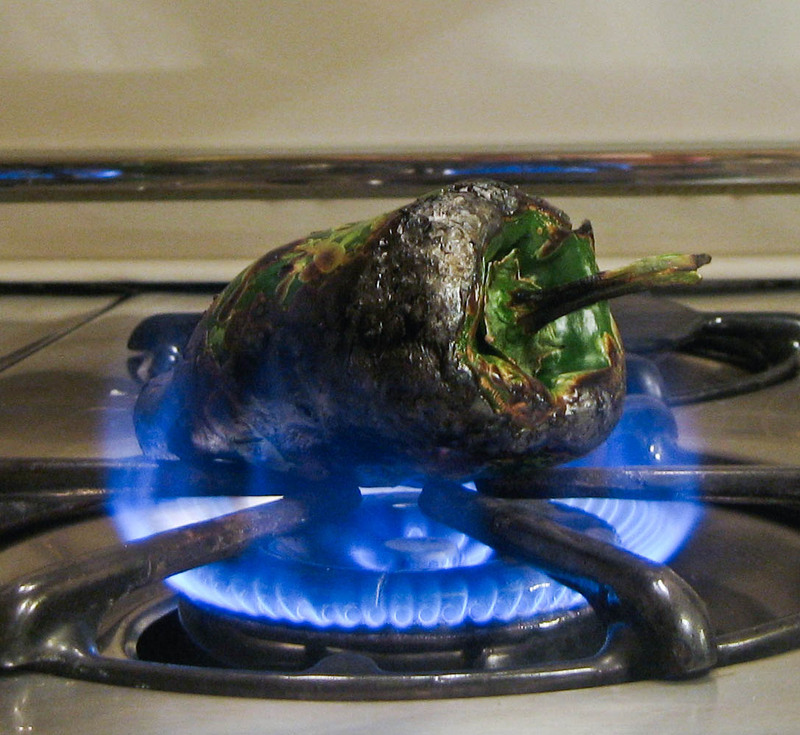 If you have a gas stove, place chiles directly on the burner and char completely on all sides. When blackened, remove with tongs from the burner and place in a paper bag for 10 minutes or so. 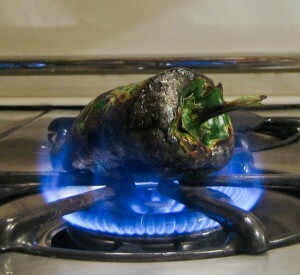 Remove the chiles from the bag and run under cold water to remove all the blackened skin. The stem and seeds are easily removed under the water as well. Cut the poblanos in strips, but keep each chile separate for measuring purposes. Heat ½ cup oil in a pan until very hot. You will see the oil shimmer. Using tongs, quickly dip the tortillas one at a time into the hot oil for just a few seconds per side. The object is to soften them and fry them just enough to not fall apart when baked. After you take them out, drain them on a cookie rack lined with paper towels. Cut them in half when cool enough to handle. then lay out 8 tortilla halves in a single layer. 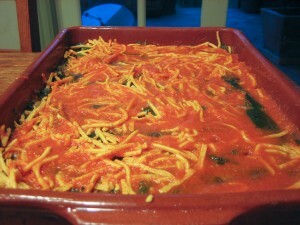 1 ½ cups red salsa, and an even layer of cheese. 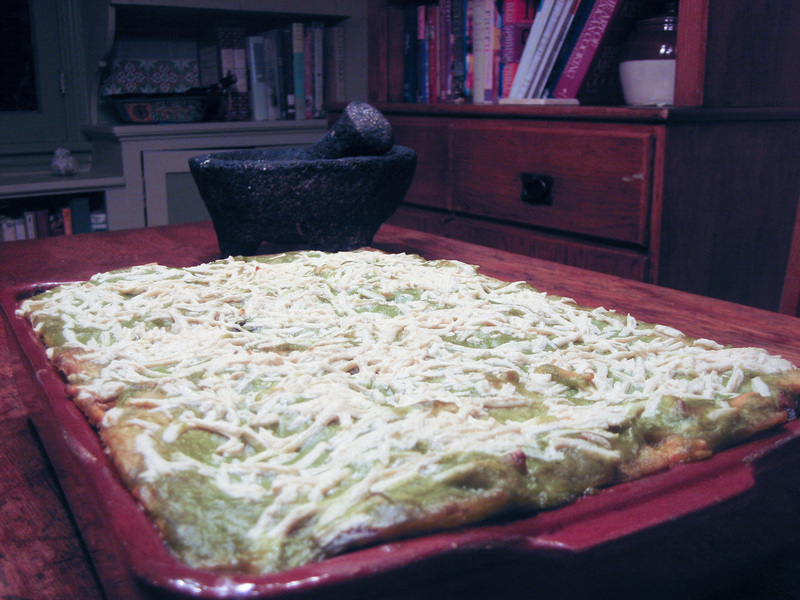 Top with another layer of tortillas, 1/3 greens, Poblano chile, 1 ½ cup salsa, and a layer of cheese. 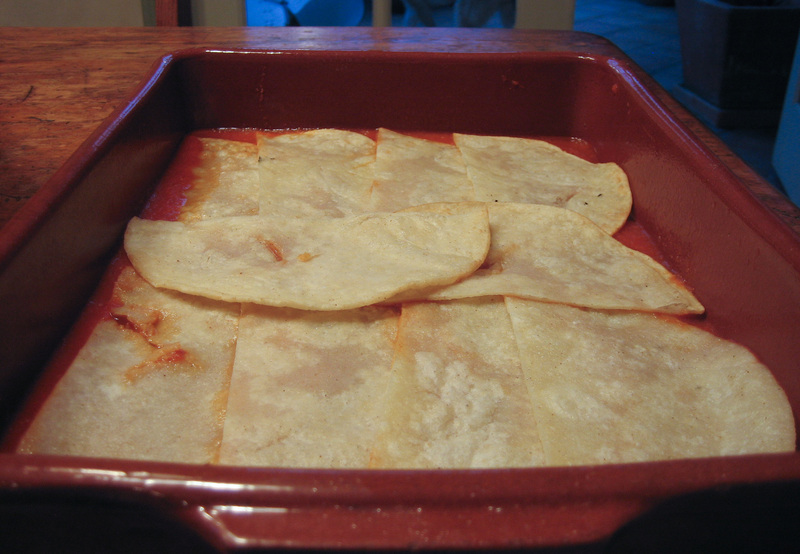 Top with a third layer of tortillas and repeat. 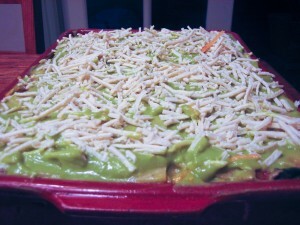 Finish by toping of the dish with the last layer of tortillas and the rest of the red salsa or green salsa, if using, and one more layer of cheese. Cover with foil and bake for 25 minutes. Uncover and bake an additional 10 to 15 minutes. Let stand a few minutes before cutting and serve. Just as good or better the next day. Andrew was the fastest finisher for our team. He blew through the last couple miles. I think it has something to do with the new Vegan diet. It MAY have something to with the new diet, but I am sure that YOU are the main reason for all the kids and their amazing day. I can’t tell you how often I have thought of you and all you have done for these kids and especially Andrew. I have never seen him more proud of any thing else in his life. Thank you!